As beneficial and convenient as an automatic garage door can be, it's not without its faults. Unfortunately, a system this complex can break down from time to time due to a variety of different issues. However, with regular maintenance, the majority of problems will be avoided. This will not only save you money on more expensive repairs, but also increase the longevity of the entire system. Our technicians will start by examining every inch of the system, from the exterior panels down to the tracks and the rollers. Anything that can benefit from lubrication will be treated accordingly, and any part that we find to be lacking in some way, will be replaced with a new unit of similar dimensions and equal or enhanced durability. In order to ensure that your door is safe to use, we will also test the photoelectric eye sensors that the opener uses to detect obstacles. These units, also known as 'safety sensors' must be perfectly aligned in order to work properly. If we find that the door doesn't reverse when something gets in its way, we'll adjust the sensor alignment and see to it that the system returns to its safe performance. 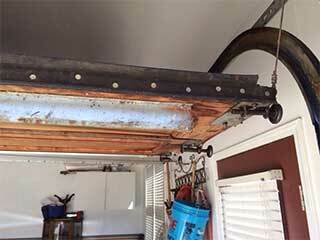 Your garage door torsion springs are another key focus point of our maintenance service. These units must be lubricated regularly to maintain their smooth and silent performance. Their tension also needs to be adjusted somewhat regularly, otherwise the door could become unbalanced, and the springs may start to overstrain needlessly, which will promote more wear and tear. We will perform any required spring adjustment and ensure that these crucial components don't break prematurely. Let our experts at Garage Door Repair Puyallup make sure that your system is able to keep functioning optimally for as long as possible. Schedule an appointment today and let us prevent a lot of problems from costing you money.